Gautama muni asked Lord Shiva for Ganga. Once he received Ganga, Gautama muni poured ganga jal on top of a dead cow and the cow arose. The place where this event took place is called Gautami Ganga or Godavari Ganga. In Godavari river, our ancestors are known as Apsaroyuga. Apsaroyuga is known as Apsaro, which flows from Kal (Shiva) Pokhari towards Gautamitat (intersection of Barun and Arun river). There is no river that flows towards Gautamitat coming from current Godavari. Godavari and Bhagirathi originate south and north respectively in Bindagiri from the same mountain. The current Bhagirathi originates in Himalayan range and Godavari is in Maharashtra. They both do not form from the same mountain. Arun river (known as Tapi in the shloka) and Yamuna (Barun river) intersect at a place called Gautami Ganga (Gautamitat). Our current Godavari river is in Maharashtra. But this doesn't match with what the shastras tell us. So where is Godavari? Note: I do not wish to offend anyone regarding my question. Our current thirthas are as holy regardless of their authenticity and I respect their location. Being a Hindu, I would never disrespect any thirtha just because they do not match with shastras. Many thirthas have changed locations and this is why I try to find their original location. Sorry if I have offended anybody. Meaning - The rivers having pure water and emanating from Vindhya Mountain are Shiva ,Payosni ,Nirvindhya ,Tapi ,Nisadhavati ,Vena ,Vaitarani ,Sinbahu ,Kumudwati ,Toya , Reva ,Mahagauri ,Durgandha and Vasila. Meaning - The flowing down from the root of Sahya parvatamala are - Godawari , Bhimarthi ,Krishna ,Vena ,Sarasvati , ,Tungabhdra ,Sprayoga ,Vahya , Kaveri ,Dugdhoda ,Nalini ,Reva ,Varisena and Kalasvana. 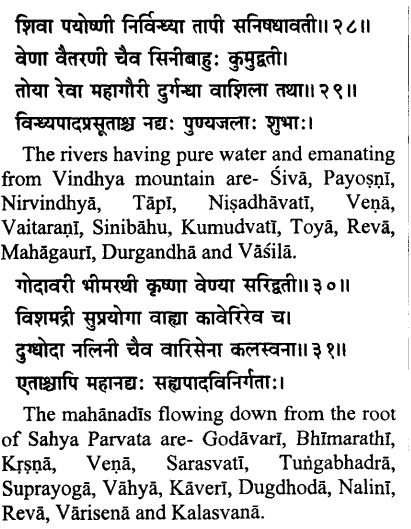 So from the above shlokas it's clear that River Godavari flows from Sahya Parvat today's Sahyadri (सह्याद्रि). And according to This It originates in the Western Ghats of central India Near Nashik ,Maharashtra. Not the answer you're looking for? Browse other questions tagged puranas history rivers . What is the significance of bathing in river in Hinduism?